SAN JUAN, Puerto Rico (CNS) — Above all material and financial considerations after Hurricane Maria’s severe damage in Puerto Rico, one must highlight the brotherly spirit shown by the island’s people during the ongoing recovery period, said the island’s top Catholic pastor. Although the church’s financial burden has obviously become heavier as it strives to meet the increased emergency material needs of the faithful, it is the people’s “huge capability for solidarity” that shines through in this disaster, Archbishop Roberto Gonzalez Nieves of San Juan told Catholic News Service Oct. 25. “There are so many helping gestures, like people who don’t know each other but share ‘our daily bread,’ and neighbors sitting down in the dark out on the street chatting,” said Archbishop Gonzalez. Due to slow government response to Hurricane Maria’s victims in Puerto Rico, there has been an increase in church and neighborhood or town groups banding together to clear remote unpaved roads, remove fallen trees and debris, and provide material aid to the neediest. Some of those youngsters come from San Ignacio Catholic High School in San Juan. Father Andres Vall Serra, the Jesuit school’s pastoral director, told CNS that the school has a special project to immerse students in providing aid to the poor. It is a class titled “Magis,” which basically means universal good, or “what can one do to reach the good of all,” based on the spiritual exercises of St. Ignatius Loyola, founder of the Jesuits. 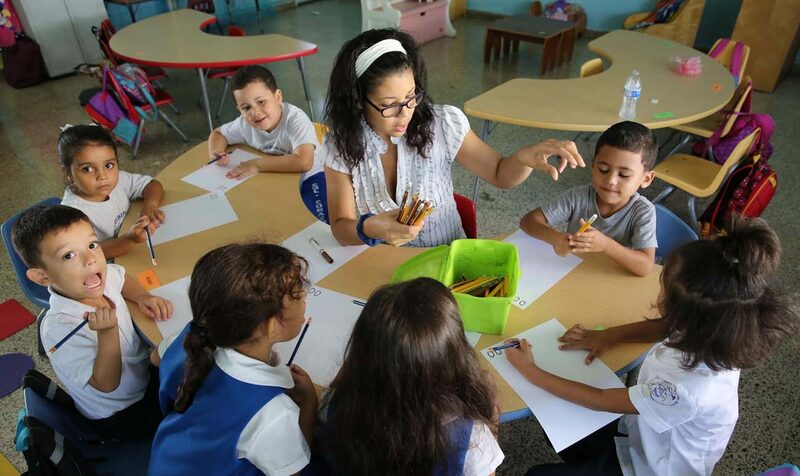 The charity project has a grade-specific mental health counseling component, aimed to help students cope with the stress brought on by Hurricane Maria’s effects. San Ignacio reopened Oct. 3, the first Catholic school to do so in Puerto Rico after Hurricane Maria, said Father Andres. It was moderately damaged, mostly by falling trees. It’s basement amphitheater and several storage units underground were flooded. He agreed with several pastors who had told CNS that, after Hurricane Maria hit Puerto Rico, Mass attendance has risen sharply, although many still could not leave their homes because of the damage. “But yes, there’s a spiritual rebirth,” he said. Church finances have been severely impacted in Puerto Rico by Hurricane Maria. As businesses and factories shut down, families’ economic stability has been affected while their financial demands have increased to cover repairs and replacement of lost property. “The top challenge the church in Puerto Rico faces is to nurture the soul our people with God’s word, Jesus’ presence through our works of charity, solidarity, celebrating the Eucharist, and maintaining a perspective that keeps us anchored in reality of these tragic events and full of hope for the strength that the Holy Spirit gives us,” said Archbishop Gonzalez.